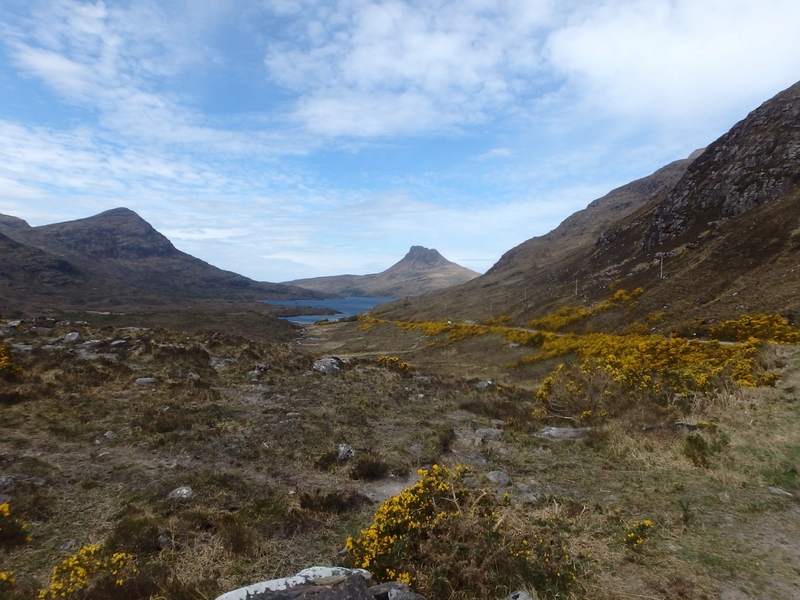 Travelling north up the A835 beyond Ullapool you enter Assynt, a land of wide open spaces and weird looking mountains. 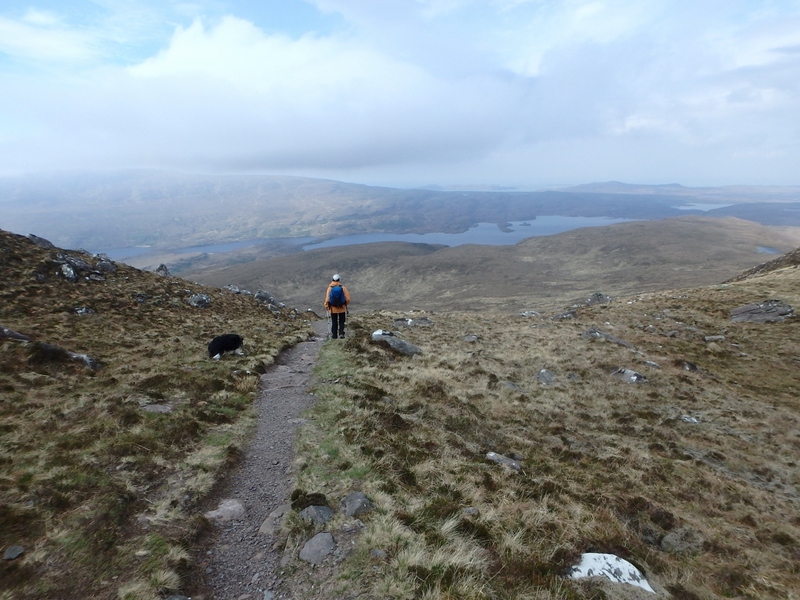 In May 2016 we had come this way and I had a great day out on Quinag, with Border Collie ‘Mist’ for company (see post #201) but lack of time meant we ignored some cracking looking mountains. 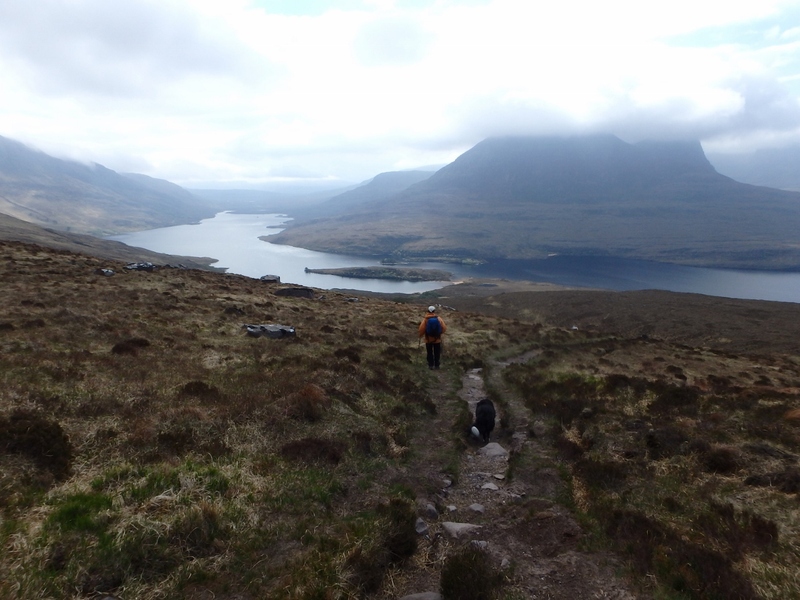 One year later (May 2017) we were back for Stac Pollaidh. 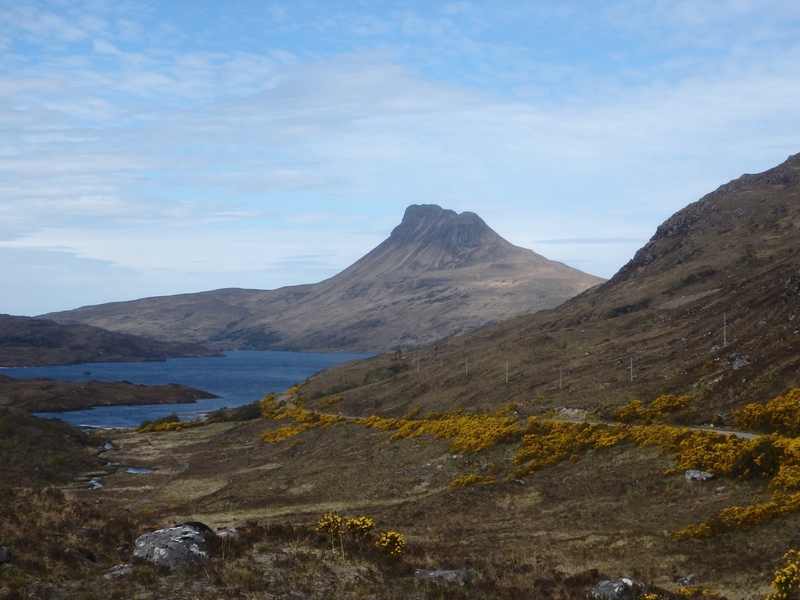 Stac Pollaidh stands out alone above Loch Lurgainn, with a sharp rocky crest often likened to a porcupine. 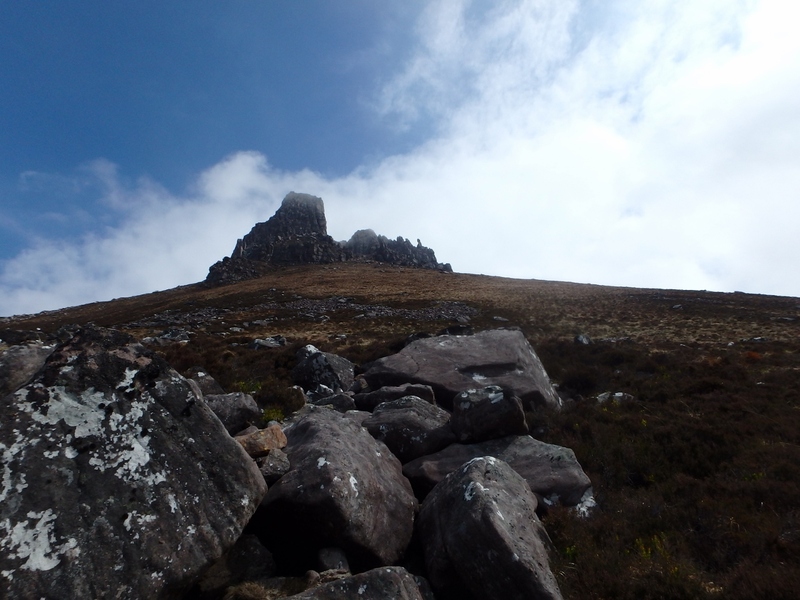 There are two summits, one to the East and easily accessible to walkers, with the true summit to the West and accessible only by a precarious scramble – in fact, some would have it that the Western Top (612 metres/2008 ft) is the most inaccessible summit on the British mainland. 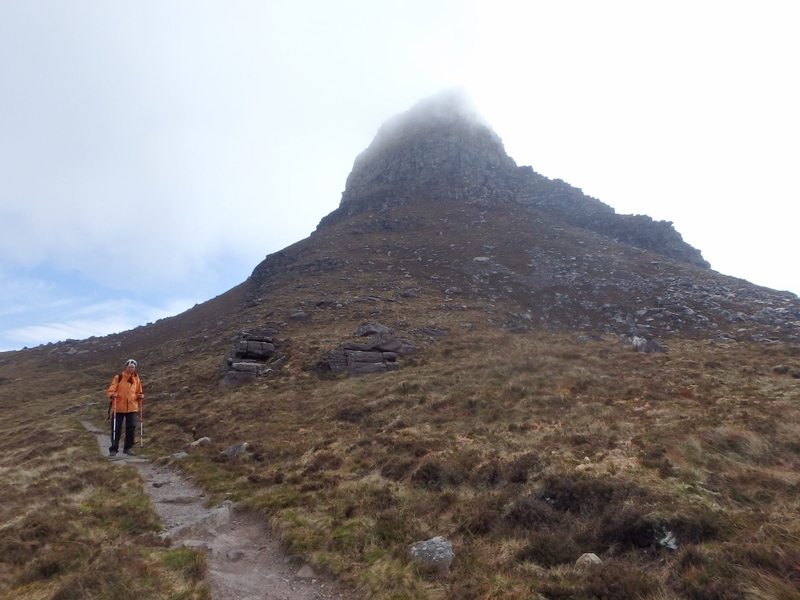 Chris ‘doesn’t do’ inaccessible summits, so we decided to settle for the lower Eastern Top (551 metres/1808 ft). 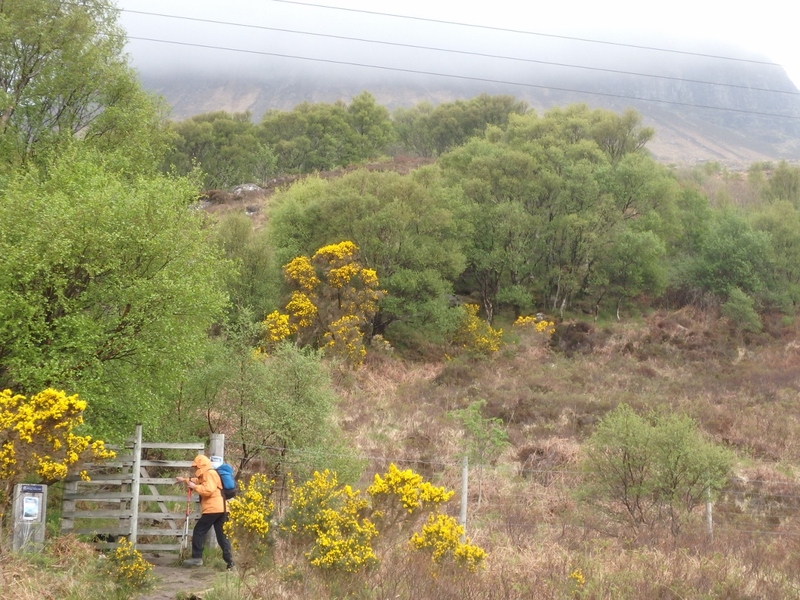 The route starts by heading up steeply through a small wood – the only reason the wood exists is due to the high fence surrounding it keeping the deer out, and the hillside above the fence was bare of trees. Nowadays there is a well-constructed path heading up the hillside, but previously the ground had become very eroded due to human traffic. 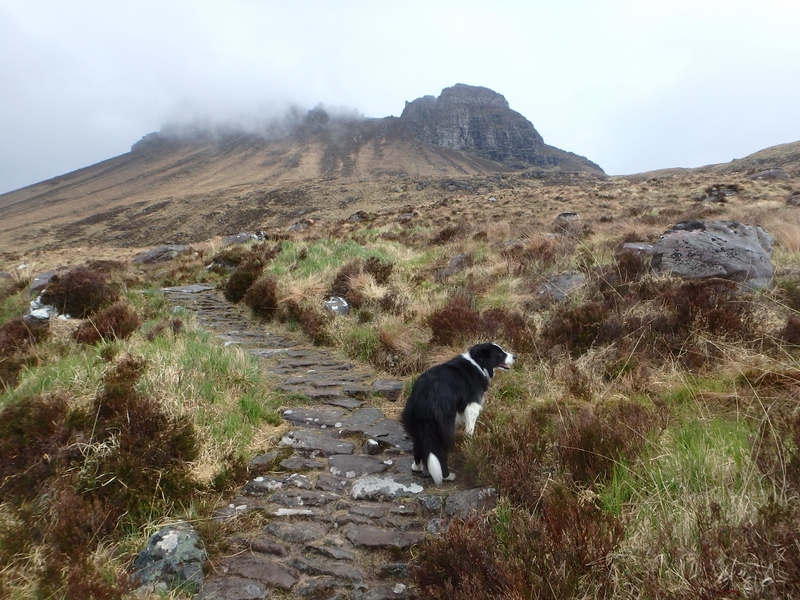 The modern path blends in well and makes for rapid progress, but mist was closing in on the top – however, Border Collie ‘Mist didn’t seem too bothered. 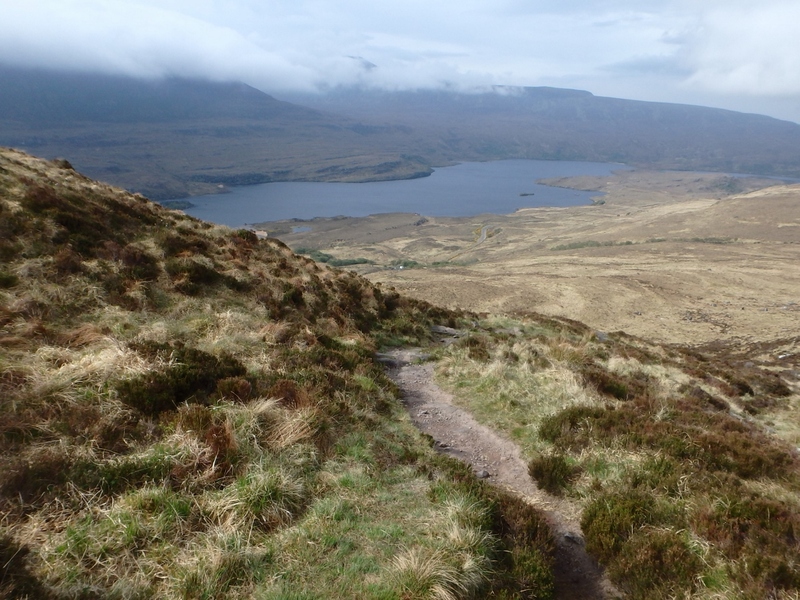 Looking southeast along Loch Lurgainn …. 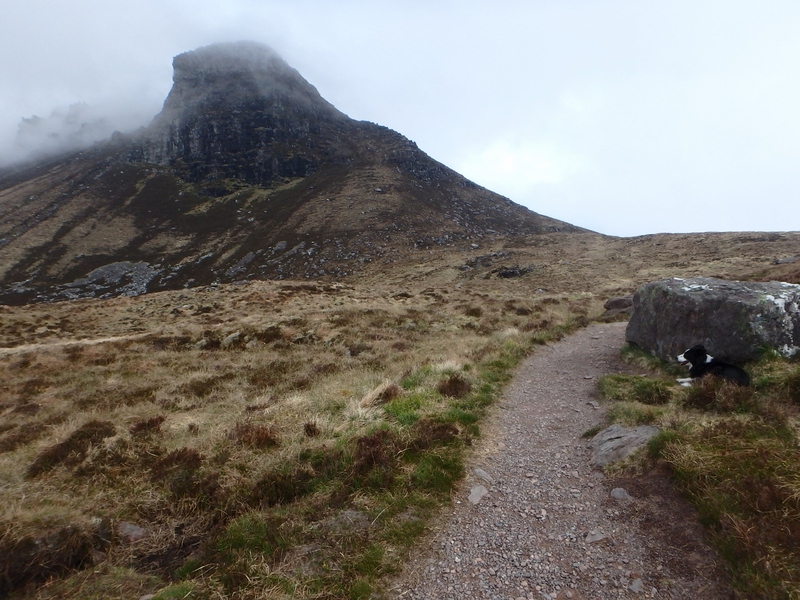 The path goes around the far side of Stac Pollaidh, where the easiest approach to the summit starts. 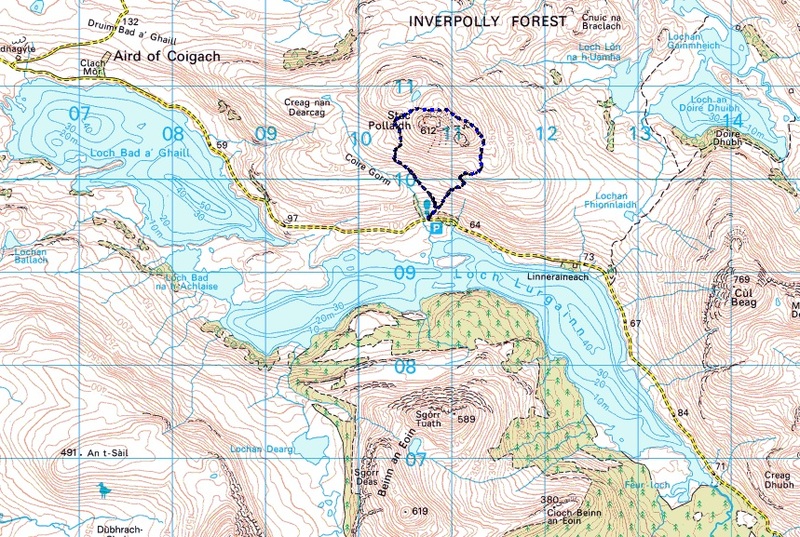 The summit route goes up to a col between the two tops, with the Eastern Top rising just above the col – the Western Top is about 300 metres in the opposite direction, following the ‘porcupine’ ridge. Unfortunately, this useful information was not gained by personal observation – the mist, which drifted in and out, restricted visibility to less than 50 metres at times. Changing visibility – clear one minute …. 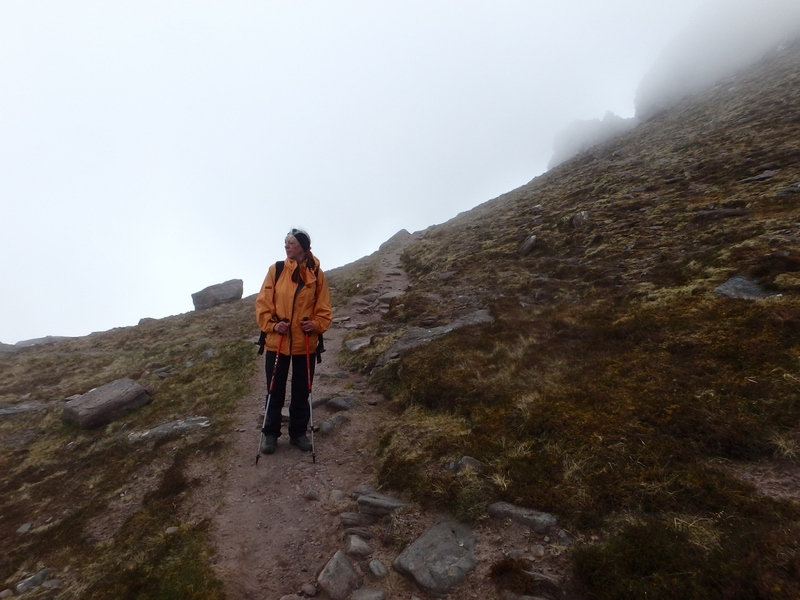 If Chris ‘doesn’t do’ inaccessible summits, it’s also fair to say that she isn’t overly keen on bad visibility! 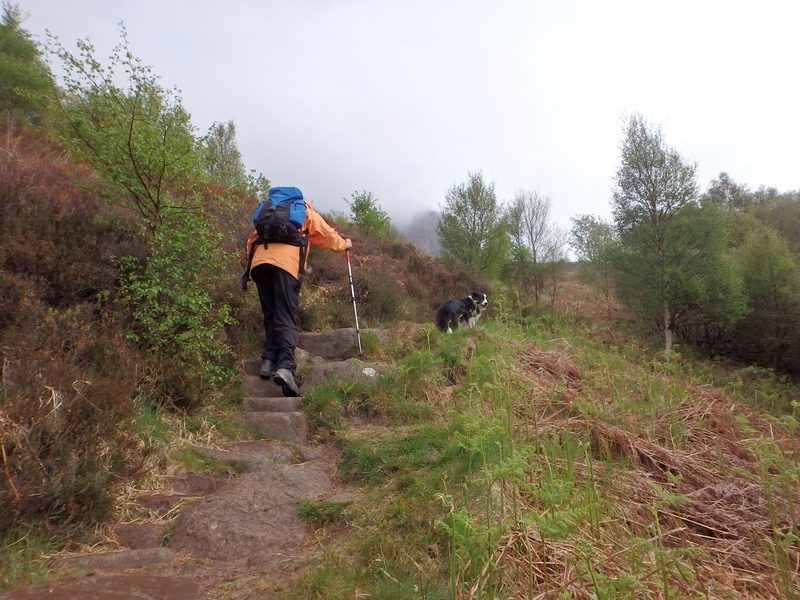 I’ll slog up most things with little more than a possibility of seeing where you are going or, indeed, where you have been – Chris, on the other hand, likes a view from the top, and to be fair she has a point. 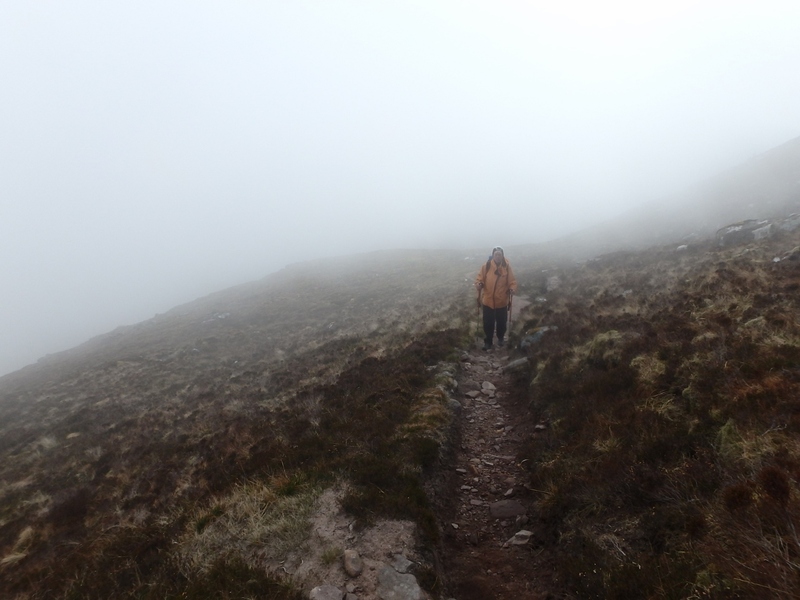 She generously suggested that she would wait on the path while I made a summit dash, but the weather was dank and breezy and it would have been an unpleasant wait. 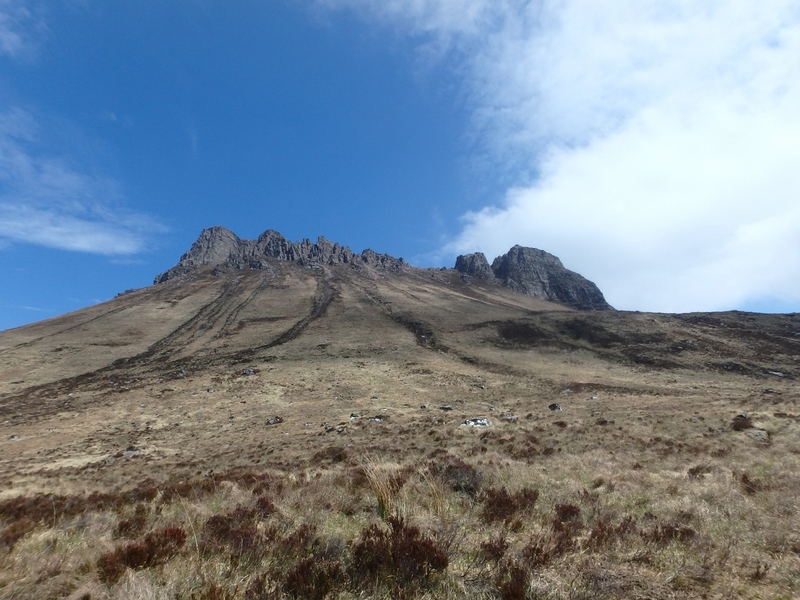 Round the back of Stac Pollaidh …. 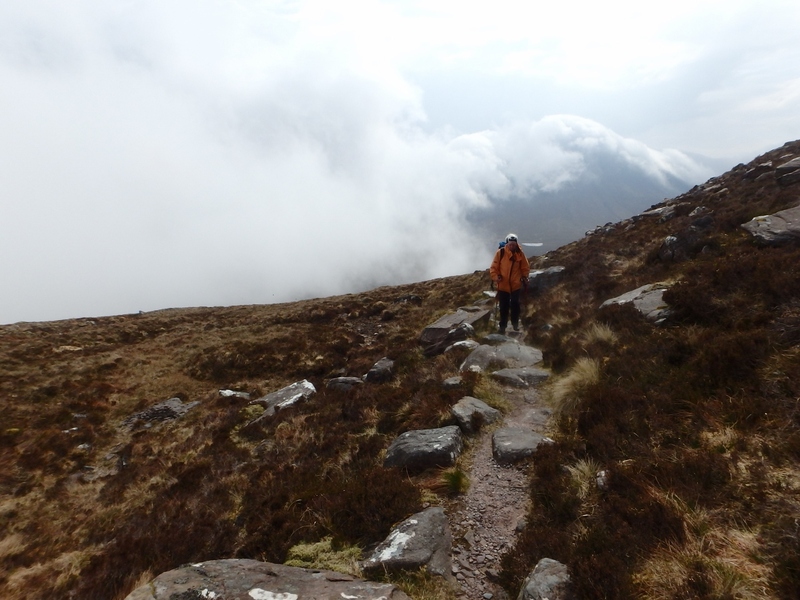 I suggested instead that we just continue with a walk around the mountain – this had one immediate benefit that a return trip (in better weather) was completely justified. 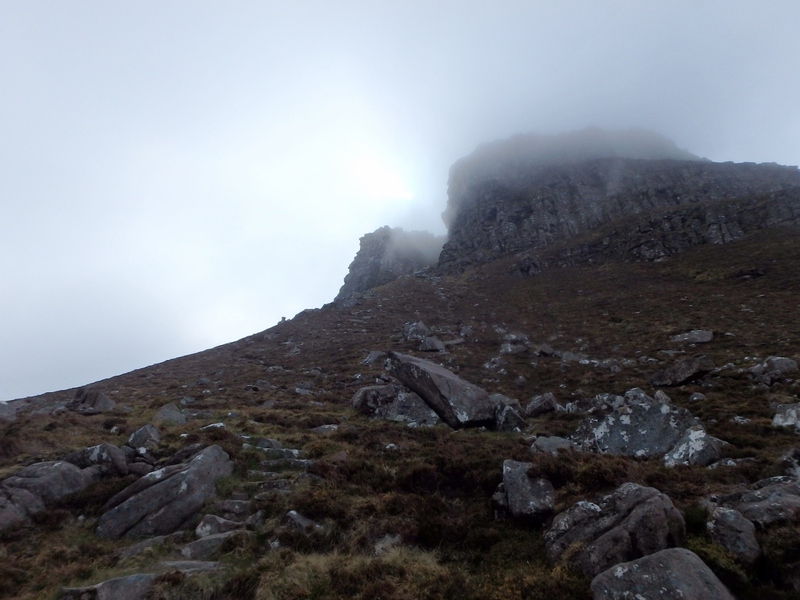 The decision having been made we continued our circumnavigation of Stac Pollaidh, with the mist occasionally mocking us by giving a tantalising view of the East Summit. 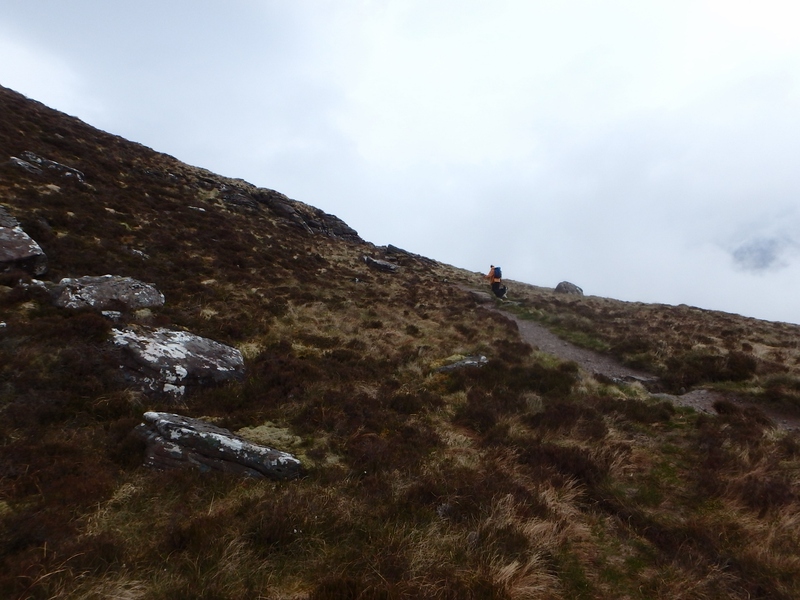 Continuing on the descent path …. 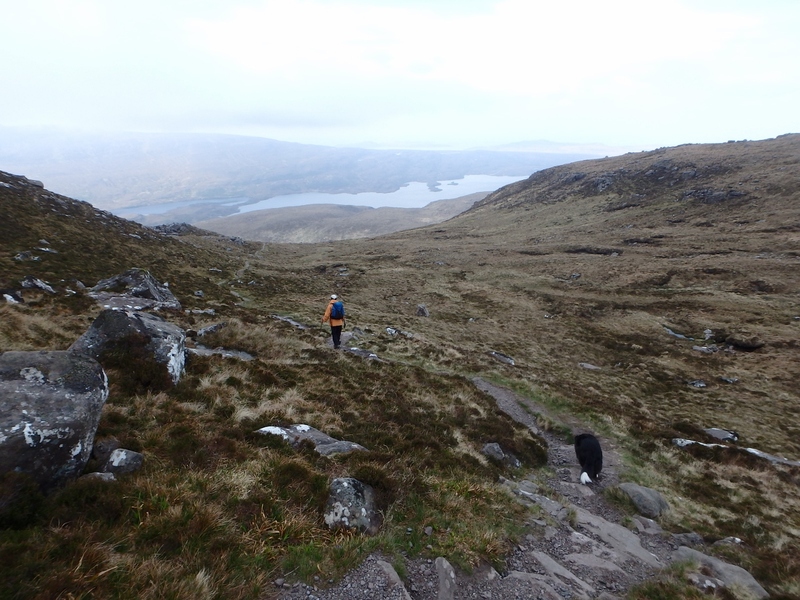 A bit of gentle uphill walking soon brought us to the start of the descent round the western side of Stac Pollaidh. The mist was still in evidence, but it was patchier now with a hint of better things to come. 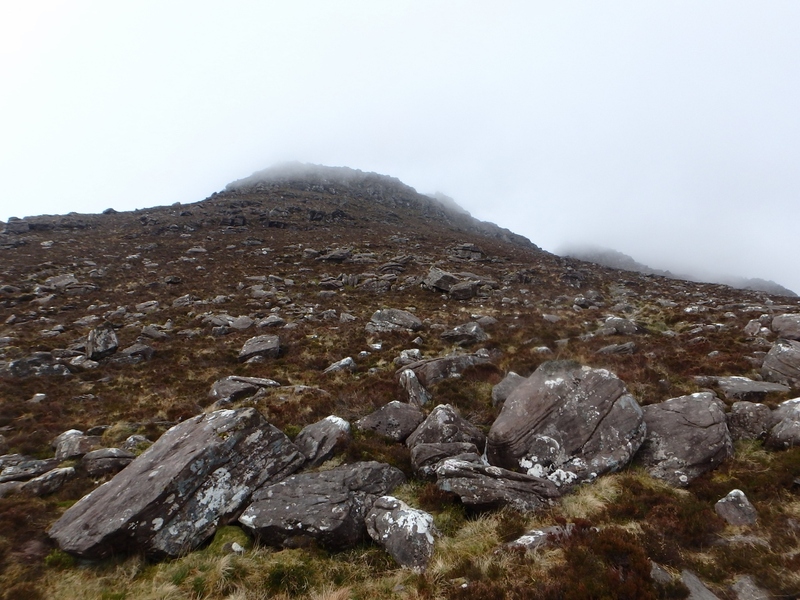 Which is exactly what happened – the lower we got, the less mist was on the summit ridge. 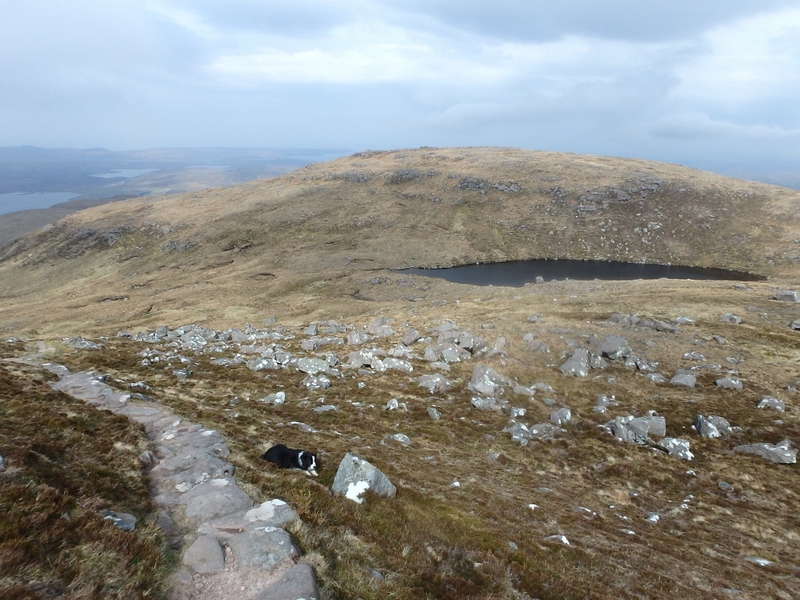 Loch Bad a’ Ghail in the distance …. …. while above the weather is still playing tricks – The West Summit now clear! Personally, I don’t mind missing a summit – after a lifetime of bobbing up and down mountains, I know now that there will always be another day, another summit. 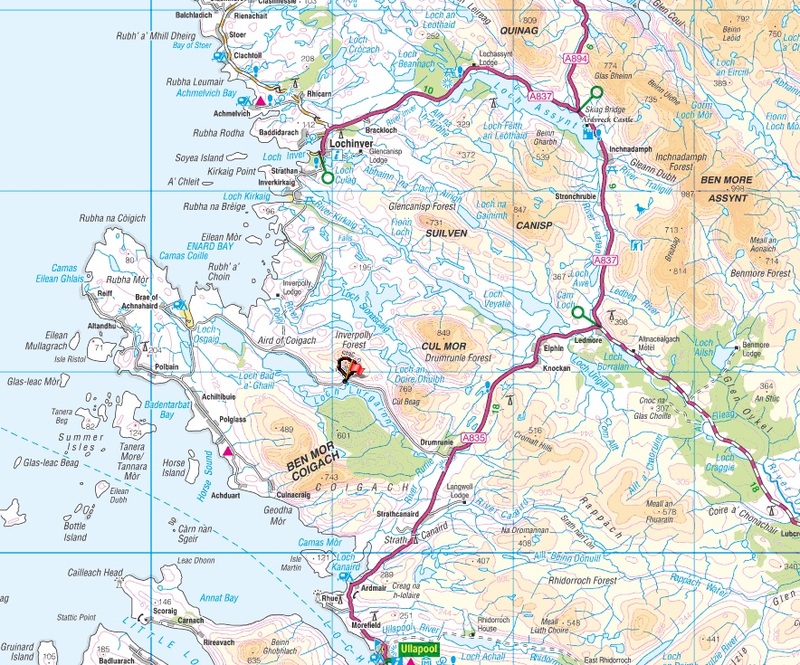 Our May trip to Scotland seems to be becoming a regular feature, and Stac Pollaidh and the rest of Assynt will be waiting for us – hopefully the only ‘Mist’ we see will be a certain black and white Collie! 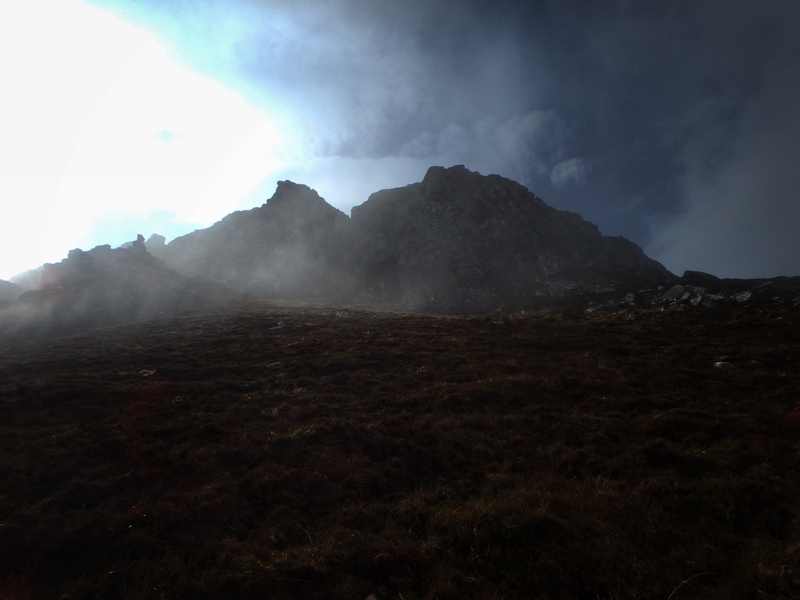 A couple of hours later – all clear over Stac Pollaidh! 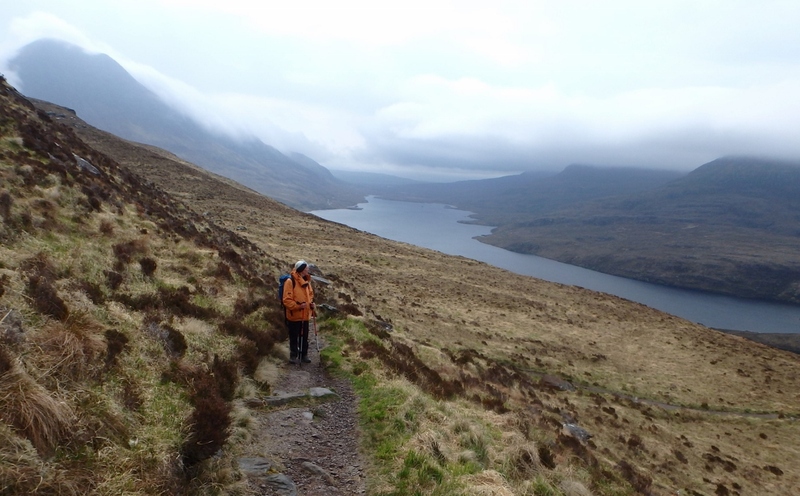 I haven’t even circumnavigated that hill yet – but, while Chris is like Richard and would turn back in that weather, I won’t and would have had to continue up to the ridge. It’s more about the challenge than the view to me! 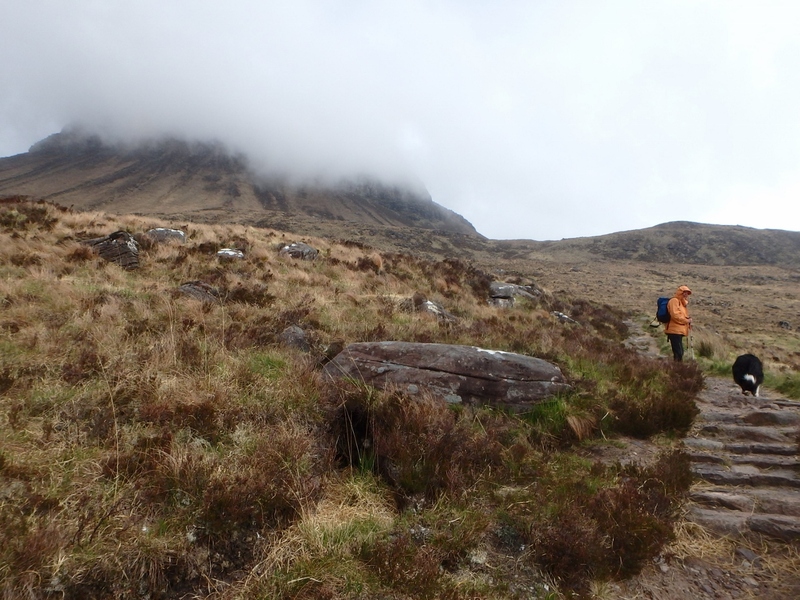 As to the mountains always being there – I used to read that a lot – still do – but have developed a counter-observation from sad reflection on my lot – the mountains will but your legs won’t! As for the legs, I think we both have a few more miles in us yet 😉 Last week I was training with the rescue team, and when we saw how high up the hill the ‘casualty’s’ light was, there was a bit of muttering! I pushed up the hill as fast as I could with normal hill pack AND a bloody Entonox cylinder – I was trying to get there in good time as I was the nominated CasCarer but it was hard work trying to keep up with guys half my age!